Was Stiniva a Cave as Well? 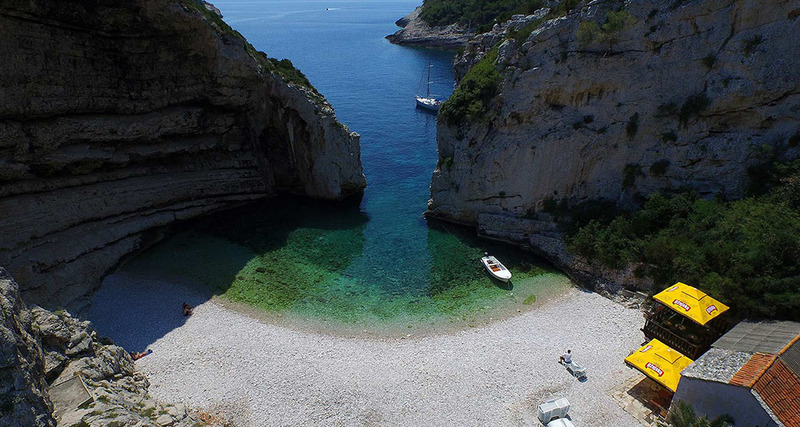 Probably the most popular beach in this part of the Adriatic, besides Zlatni Rat in Bol, and definitively the most famous beach on island Vis is Stiniva Cove. 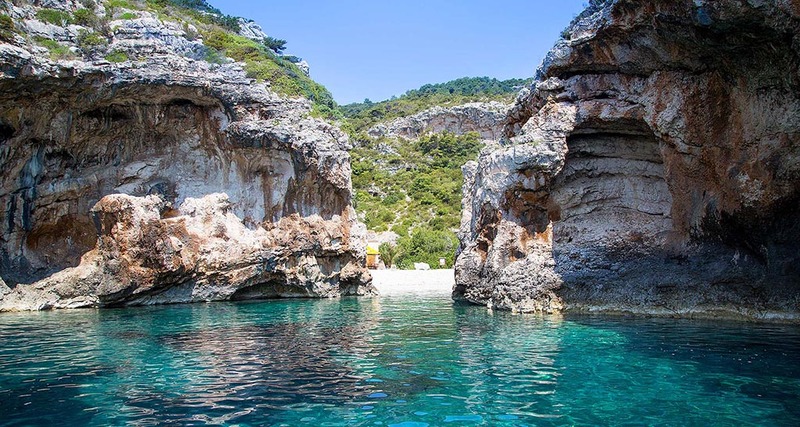 You have undoubtedly seen photos of Stiniva Cove with its beach in many travel magazines promoting Croatia and probably wondered where that beach is located, hoping you will one day get the opportunity to visit it. 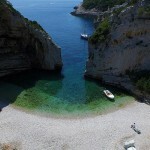 Tour starts every day at 08 AM from Promenade in Split. Return from Split is scheduled around 06:30 PM. Itinerary is subject to change due to safety and weather conditions. Here you can purchase your ticket for the Blue Cave Tour from Split. You will receive your tour ticket immediately upon booking confirmation. You don’t need to print our the tour ticket, just show the ticket to us, once you arrive in our office, on your cell phone or tablet. 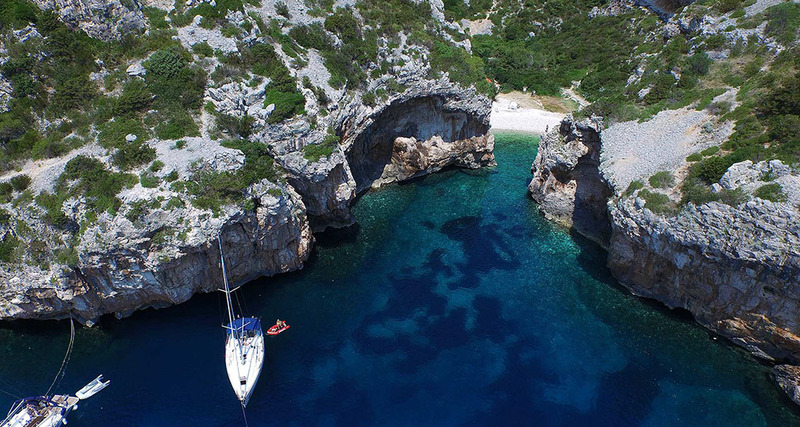 Included in the ticket: free pick up service (subject of availability), free wine tasting in Milna (island Brac), snorkeling mask, water/windproof jacket, safety equipment on board, insurance. When you click the Book Now button on the Blue Cave tour from Split you will be taken to our day tours booking system that will automatically reserve the number of seats on the speedboat you wish to book. As you book your ticket for the tour, no matter how much in advance, you can be sure that your seats will wait for you as you arrive on the tour date. Immediately upon booking your tour ticket will arrive to you inbox and all you have to do is have it with you once you arrive at our meeting point. You don’t need to print the ticket, just show it to us on your cell phone and you will be set to go on the tour. In case something unexpected happens and you are unable to go on the tour on the booked date just contact us and we will reschedule your tour for the different date or even, in some cases, refund your ticket completely. 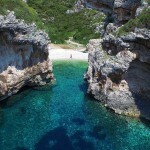 Stiniva Cove is located on the south side of Vis island just a 15 minute ride from the Blue Cave by our speedboat. It is a long protected bay with the main attraction hidden deep at its bottom. Massive stone walls at the bay bottom form a narrow entrance to the small bay with the silver pebble beach at its base. 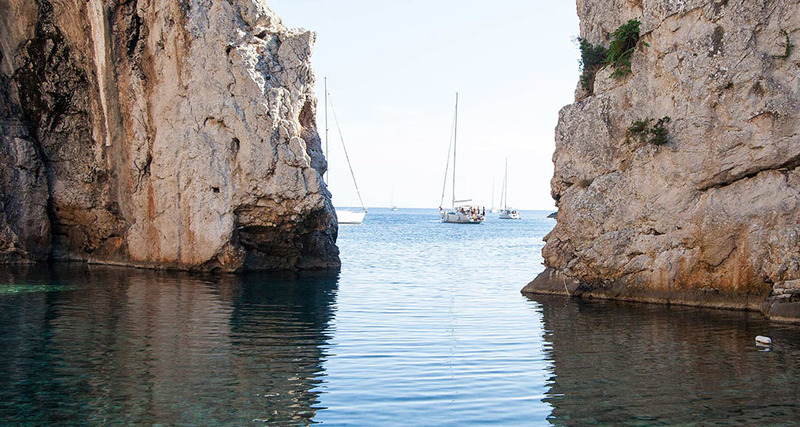 As you enter Stiniva bay the pebble beach and its small bay are well protected by the tall stone gates that many who pass through here are unaware of the natural beauty hidden right within their grasp. 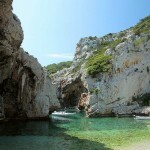 It is speculated that Stiniva Cove was once a cave whose ceiling collapsed forming a natural phenomenon we witness today. This speculation could as well be truth as you can clearly imagine cave entrance, which is now Stiniva gates, cave walls which are there to this day, with only a cave ceiling missing to form a complete picture. 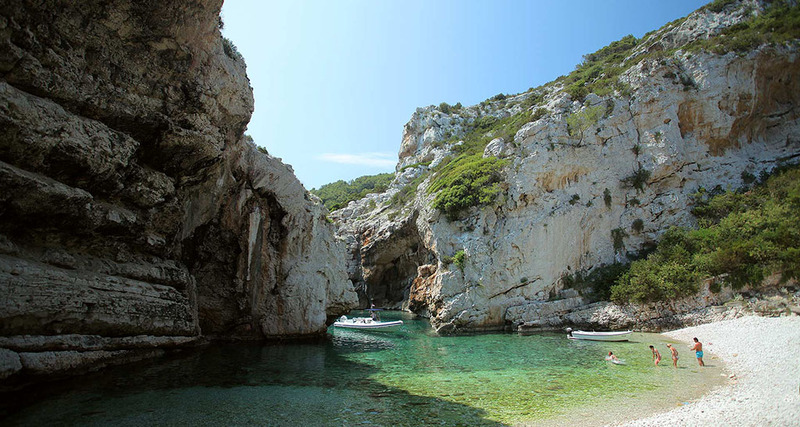 We moor our speedboat just outside the Stiniva gates and give you enough time to enjoy in Stiniva Cove properly. What better way to do it then by swimming, snorkeling and sun bathing at its pebble beach. At the Stiniva bay, where we are moored, the sea is deep but extremely clear so you can easily see all the way to the sea bottom. This is the perfect place to take a snorkeling mask we have on board and enjoy in the healthy marine life below you. 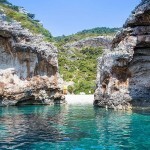 You will see different species of fish swimming all around as you snorkel towards Stiniva gates. 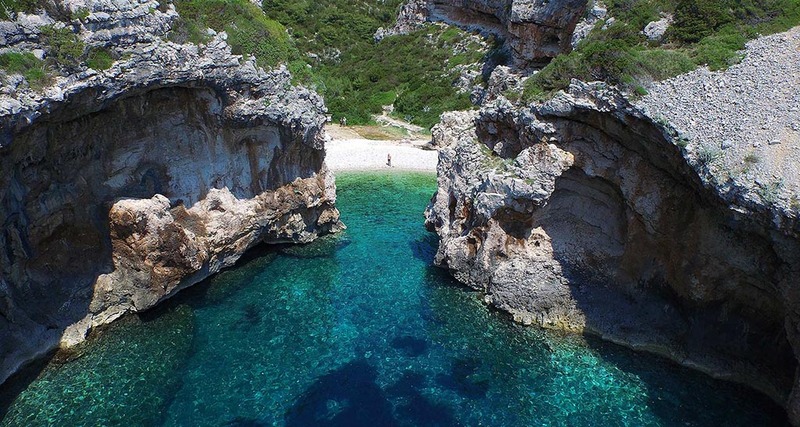 Because the sea of Stiniva bay is so clear this is a great place to take underwater photos with the waterproof camera so make sure to bring one if you have it at your disposal. Usually we have such camera on board so if you want to make a few underwater selfies just consult with our crew. 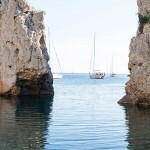 As you reach Stiniva Gates all the beauty of the Stiniva Cove starts unfolding before your eyes. Massive walls surround a shallow clear bay with silver pebble beach inviting you to lay down and enjoy in the view that is surrounding you. In the far corner of the beach there is a small bar if you are in need for a quick refreshment. After approximately half an hour we meet again on the speedboat and proceed towards the next destination on our Blue Cave excursion. I'm really happy I chose this group to do some island hopping in Croatia. They were extremely nice, fun & helpful! Our most enjoyable and memorable day in Split! Crew was nice and very helpful. If you're looking for an amazing day out when visiting Split, DO NOT miss getting on a Sugaman tour to the islands and blue cave! We really enjoyed the tour of Blue cave and other attractions, was definitely the highlight of our stay in Split and the area!